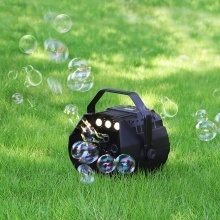 Enjoy thousands of bubbles per minute with a powerful motor with extremely low noise. Perfect for creating the best exciting and celebratory mood, creating dreamy atmosphere for parties, stages, wedding etc. Easy to use, fill with a certain volume of bubble fluid, plug and play. With high performance motor is great for producing a continuous stream of bubbles. It can be used in both manual control and wireless remote control. Equipped with a detachable handle and lightweight design, portable for convenient use. Can be easily and effectively maintained just with regular cleaning. Great for creating exciting and celebratory mood on weddings, parties and so on. Please do not look directly at the light, or it may damage your eyes. The product does not have a waterproof function, please pay attention to the environment while using this product. 0.5-1" error might exist due to manual measurements, please kindly understand.